The Blessed Virgin Mary, immaculately conceived, is the mother and queen of our parish. In 1854, Pope Pius IX defined in the Constitution, Ineffabilis Deus, that the Blessed Virgin Mary was immaculately conceived. This pronouncement came as a crown to a long held belief and doctrine of the Church, whose finer points were established during the late Middle Ages and which had been universally accepted and honored since the seventeenth century. Four years later, Mary herself appeared to a peasant girl, to place Heaven’s seal of approval on her newly decreed title. Bernadette Soubirous was so poorly educated that she could have no way of knowing the Pope’s recent declaration concerning the Mother of God. 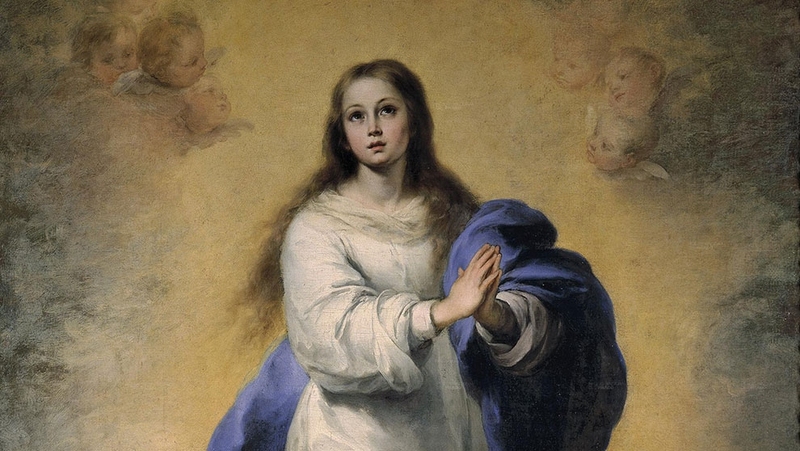 Nonetheless, when commanded to ask her heavenly visitor’s name, she received the answer, ‘Que soi era immaculada concepcion—I am the Immaculate Conception.’ What better proof could we ask that Mary was indeed conceived without stain of original sin, fitting channel by which the Son of God would enter the earth. Devotion to our Immaculate Lady in the United States actually preceded both of these seminal events. In 1846, the Catholic Bishops of America gathered in Baltimore to open the sixth Council of that city. During this Council, a decree was passed, that ‘with enthusiastic acclaim and unanimous approval and consent, the Fathers have chosen the Blessed Virgin Mary, conceived without sin, as the Patroness of the United States of America.’ In a later session, they also agreed to request that Rome allow them to apply the title ‘Immaculate’ to any mention of Mary’s conception in the liturgy and divine office. All of these favors were approved and granted by Pope Pius IX in September of 1846. It can even be stated that the American Catholic Church’s devotion to the Immaculate Conception played an important role in prompting the institution of the dogma eight years later. Our Lady, specifically as conceived without sin, makes a particularly apt patroness of our country. The United States was founded on the optimism of countless colonists, who arrived from so many European countries in search of a future on its shores. Every immigrant to America has longed for a new beginning, a fresh start and a hopeful path forward. What better protector of such desires could we ask than the woman who gave to humanity its Redemption and new Life? Granted, the States have not always remembered their patroness, nor taken her Son as their King, but all the more should we pray for such a conversion to occur. As a reminder of all these truths, and of our Catholic duty to represent them for our fellow countrymen, our community has taken the country’s patroness for its own. The Blessed Virgin Mary, immaculately conceived, is the mother and queen of our church. Her protection guides us in our Catholic mission in the world.